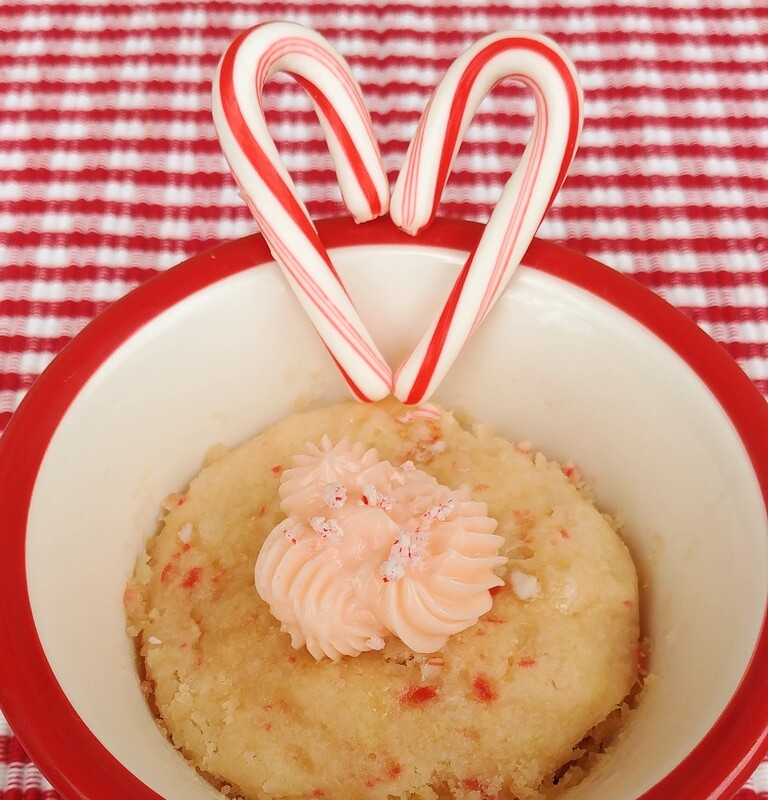 Mini Candy Cane Magic Cake–what is the magic you may be asking? The magic part is that I can make it! (No, there really is more, keep reading.) You all know I am not a baker, much to the disappointment to my sweet tooth family, especially my mom. Whenever I happen to have excess sweets in the house, one sure way not to waste any of them, is to freeze them for my mom’s next visit. It makes me feel better to be able to offer her sweet treats, even if I didn’t make them. But this year for her Christmas visit, she is in for a real treat. A real sweet homemade treat for breakfast…and in under five minutes from start to finish. I’d call that magic! I think candy canes at Christmas are much like candy corn at Halloween–an often overlooked treat of the holiday. Maybe it’s because candy canes have been around for so long. We’re so used to seeing them everywhere that perhaps they lose their sweet appeal. Well, here I am to help you see the red and white candy stripe light. The mini candy canes that I purchased offer six per a 100-calorie snack pack! No, that’s not advertised on the box, but 3 candy canes are only 50 calories, so I joked to myself that I could eat six for a 100-calorie snack pack. A snack pack of candy canes, HA! For this Candy Cane Magic Cake, an 8-oz mug will be perfect for one serving or double the recipe for a 16-oz mug to share. If you’re like me and are a coffee lover and only have gignormous mugs, just use ramekins. This quick and easy sweet treat goes especially well with hot chocolate. Crush candy canes. Add to a paper bowl along with 4 tsp warm water. Microwave for 30 seconds. Stir until melted. Set aside. Add Challenge butter to an 8 oz mug or ramekin. Microwave until melted. Swirl butter around sides of mug or ramekin. 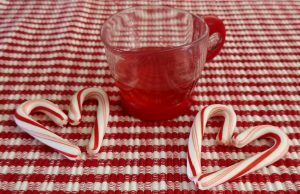 Whisk in milk, sugar, and 2 tsp candy cane syrup. Whisk in flour and baking powder. Whisk until smooth. Top with some candy corn pieces, if desired. Microwave for 90 seconds. Let cool. Using a wooden spoon, beat butter until smooth. Add powdered sugar, milk, and remaining candy corn syrup. Top cake with icing and candy corn pieces, if desired. Put Your TO COOK IS TO CREATE Thinking Cap On: Like chocolate and peppermint? Add chocolate chips to the top before baking. Have eggnog? Use it in place of the milk. Are you a lover of sprinkles? Add them. Want more of a “cookie” texture? Use brown sugar instead of white. Know I have some crazy ideas, but have you seen some of the wild candy cane flavors out there? Start there with one you like for a definite cake game changer! Oh boy! The Hunt kids will be whipping these up during the holidays! Love mug cakes and this is a new one! Thanks for the inspiration. I’ll send pix!